Extensible - Data driven - Automation framework. Vibz Automation Framework is not a tool to perform some specific task, but is an infrastructure that provides the solution where different tools can plug itself and do their job in an unified manner. Hence providing a common platform to the automation engineer doing their job. Vibz Automation Framework is designed keeping in view the easy of extending the scope of automation to meet any requirement which can be automated. Whether it is a web automation or a windows automation, anything can be brought under the unified framework either by using built-in modules or including extended module to the framework. The scope can be extended in four different directions. Extensible framework: Whether it is a web automation or a windows automation, anything can be brought under the unified framework either by using built-in modules or including extended module to the framework. Data driven architecture: The framework architecture is designed such that the test driving instructions can be scripted into a flat Xml files. This further provides better scalability on a whole. Modular approach for scripting: The test scripts can be maintained into smallest functional unit and there after can be invoked from any other test case that defines similar functionality within it. With this framework facilitates re-usability of code and ease of maintenance. Logic separated from Data: To further improve the scalability and reduce the maintenance the scripts should be segregated three sections. Easy flow controlled using loops: Keeping in mind the various complexity of the automation the framework, does support the loops. Like most of the language the framework provides three types of Loop logic. Quick Automation using Vibz Automation Studio: Vibz automation comes with a Automation Studio which provides single point of writing, building, configuring and testing automation script. The team can well maintain the source repository the way the application developers do. Quick setup on Execution Environment: Vibz Automation Framework offers the necessary run-time components to execute an automation script which was developed using Vibz Automation Studio. Build scripts is a single flat file generated after collating data from various test files. This build file can easily be ported or executed on any remote system provided the the framework is installed on it. Scheduling of Build script: The framework provides a facility to schedule your script execution at some regular interval or on some criteria fulfillment. This is useful in case of running a bot to crawl a site or starting a testing process when a new build arrives. This is yet another open end where the framework can be extended to provide your own custom scheduling. Support for Globalization: Globalization can be achieved by writing a language converter macro function (say translate(LANG_CODE)) and use it instead of hard coded data. Ease of scripting: Any module on getting registered to the framework will have its instructions available in instruction dictionary. During scripting the studio provides the context sensitive help. Data driven architecture: The framework architecture is designed such that the test driving instructions can be scripted into a flat Xml files. This level of abstractions provides functional QA's to focus more on test functionality rather looking into the complexities of under-lying tool. This further provides better scalability on a whole. Any other extended logic's, like whether the test should fail at a point or should continue which is generally missing in a tool can be handled at modular level with in the framework. Note: Although the framework does not stop you from writing your script into a single file, but as a good practice we suggest our users to segregate them into different files which has least maintenance cost involved. 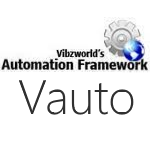 Quick Automation using Vibz Automation Studio: Team working on unified framework can have their 100 percent concentration on writing the functional aspect of the application. Vibz automation comes with a Automation Studio which provides single point of writing, building, configuring and testing automation script. In a distributed architectural system team can work on a single automation project yet on separate feature of it. They can very well maintain the source repository the way the application developers do. Quick setup on Execution Environment: To execute the automation script, the execution environment just need to have installed framework and the build script (executable file: VACS). Vibz Automation Framework offers the necessary run-time components to execute an automation script which was developed using Vibz Automation Studio. Build scripts is a single flat file generated after collating data from various test files. This build file can easily be ported or executed on any remote system provided the the framework is installed on it. Scheduling of Build script: Although the process is automated, there is a need to initiate the execution. The framework has gone a step ahead to provide a facility to schedule your script execution at some regular interval or on some criteria fulfillment. This is useful in case of running a bot to crawl a site or starting a testing process when a new build arrives. This is yet another open end where the framework can be extended to provide your own custom scheduling. One can have as many scheduled event running in parallel. Support for Globalization: With the extensible macro feature, globalization can easily be achieved by writing a language converter macro function (say translate(LANG_CODE)) and use it instead of hard coded data. Easy of scripting: With Automation Studio in place a script writer need not worry about knowing bunch of instructions and their syntax. Any module on getting registered to the framework will have its instructions available in instruction dictionary. During scripting the studio provides the context sensitive help. By now you must have seen the challenges in automation world and realized the need of a robust framework for everlasting testing strategy. Now lets redefine the automation strategy and review the candidatures for an ideal framework. Test automation is a fulltime effort, not a sideline. The test framework must be well thought out. It must be documented. It should be reviewed. It should be tested. It is a full software development project like any other. This bears repeating--again. The test design and the test framework are totally separate entities. The test design is the business logic for the application under test. It tell us what to do, how and when to do it, what data to use as input, and what results we expect to find. This doesn’t care whether the application will be tested automatically or manually. On the other hand, the test framework is an execution environment for automated tests. It is the overall system in which our tests will be automated. The development of this framework requires completely different technical skills than those needed for test design. The test framework should be application-independent. The test framework must be easy to expand, maintain, and perpetuate. One of our goals should be a highly modular and maintainable framework. Generally, each module should be independent and separate from all the other modules. What happens inside one is of no concern to the others. The test strategy/design vocabulary should be framework independent. The framework refers to the overall environment we construct to execute our tests. The center-piece is usually one of many commercially available automation tools. In good time, it may be more than one. In some rare circumstances, it might even be a proprietary tool developed or contracted specifically for our test automation needs. The point is, different tools exist and some will work better for us than others in certain situations. While one tool might have worked best with our Visual Basic, Java or C/C++ applications, we may need to use a different tool for our web clients. By keeping a specific tool consideration out of our test designs, we avoid limiting our tests to that tool alone. The overall test strategy will define the format and low-level vocabulary we use to test all applications much like an automation tool defines the format and syntax of the scripting language it provides. Our vocabulary, however, will be independent of any particular test framework employed. The same vocabulary will migrate with us from framework to framework, and application to application. This means, for example, the syntax used to click a button will be the same regardless of the tool we use to execute the instruction or the application that contains the button. The test strategy/design should remove most testers from the complexities of the test framework. In practice, we cannot expect all our test personnel to become proficient in the use of the automation tools we use in our test framework. With suitable framework in place the bulk of our testers can concentrate on test design, and test design only. It is the automation framework folks who will focus on the tools and utilities to automate those tests.